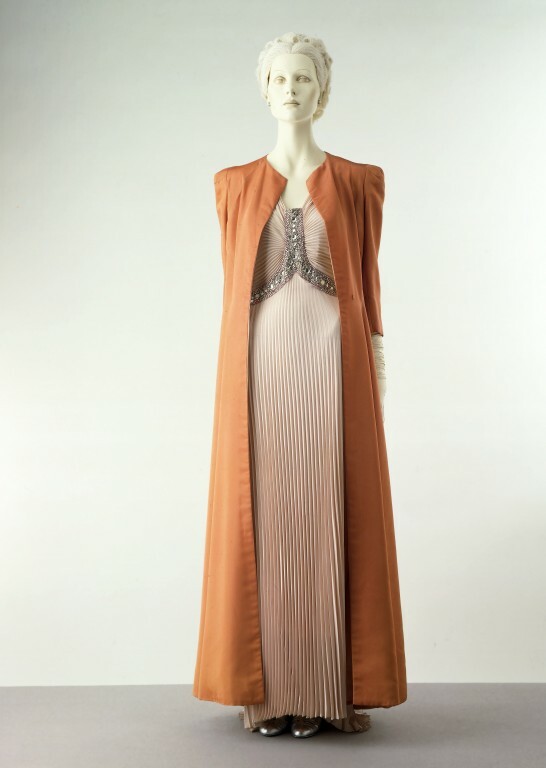 This elegant evening ensemble was designed by London couturier Peter Russell. It was worn by Mrs John Fraser (Ruth Vincent) and given by her son, Mr John Fraser. An almost identical version made in lamé was featured in Vogue magazine, where it was described as an ideal presentation dress. This ensemble forms part of the Cecil Beaton Collection, brought together by the society photographer Sir Cecil Beaton (1904-1980). With great energy and determination, Beaton contacted the well-dressed elite of Europe and North America to help create this lasting monument to the art of dress. The Collection was exhibited in 1971, accompanied by a catalogue that detailed its enormous range. Evening ensemble consisting of embroidered crêpe dress and wool coat. 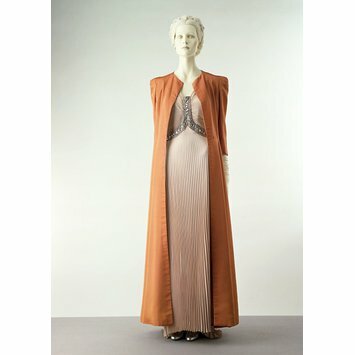 Evening ensemble consisting of embroidered crêpe dress and wool coat, designed by Peter Russell, London, 1937.